Undated postcard depicting the American Ambulance Hospital at the Lycée Pasteur in Neuilly-sur-Seine, France. RG1/002, American Field Service World War I Photographic Collection. This image cannot be reproduced outside the guidelines of United States Fair Use (17 U.S.C., Section 107) without advance permission from the AFS Archives. Veterans Day is an American federal holiday honoring veterans of all wars on November 11th each year. Initially, this holiday was known as Armistice Day, which commemorated the signing of the armistice ending wartime hostilities on the Western Front during the First World War. In honor of this holiday celebrating the “end” of the war, this month’s post is about the “beginning” of AFS, which today serves as an organization that provides intercultural learning opportunities to help people develop the knowledge, skills, and understanding needed to create a more just and peaceful world. The American Ambulance Hospital in Neuilly-sur-Seine, depicted in the postcard above, was the original location of the organization that became known as the American Field Service (AFS.) 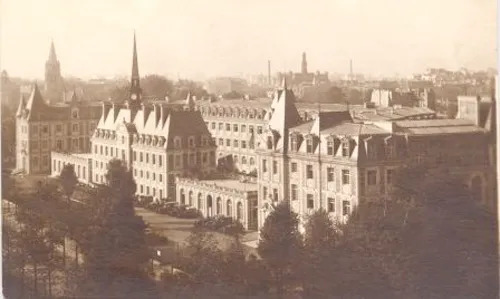 The American Hospital of Paris, established before the outbreak of war in 1914, used the unfinished Lycée Pasteur as their military hospital (also referred to as an “ambulance”) to accommodate a larger number of patients. A. Piatt Andrew, a former director of the United States Mint, set sail for France in December of 1914 in order to volunteer with the hospital, and later became Inspector General of their Transportation Committee. In 1915 Andrew convinced the French army to let the ambulance drivers of the hospital work closer to the front lines of battle. His organization of drivers, known initially as the American Ambulance Field Service, broke away from the hospital in 1916 and established an independent headquarters in the heart of Paris for the remainder of the war. Click here to view photographs of the American Ambulance Hospital preserved in the AFS Archives.